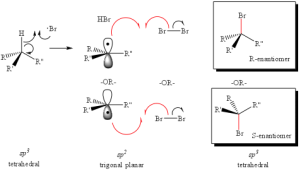 This is the second part of a multi-part module on Free Radical Halogenation. 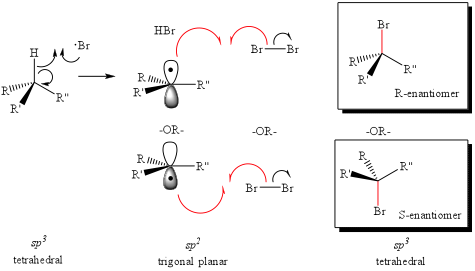 Radial intermediates (step 2a product) produce an sp2-like hybridization orbital with the lone electron in the vacant 2p orbital, therfore attack of the radical electron on the C-H bond can take place from either side of the molecule. The result will always produce an RACEMIC MIXTURE (or equal amount) of the two enantiomers.